Rating: Liked a lot until the very end! One-sentence summary: A doctor comes to terms with her nightmares, her fears, and her hopes when she's sent to the Amazon to fetch a colleague. Do I like the cover? : I do -- it's very pretty and eye-catching, although I would have loved snakes or birds on the cover since they feature so hugely in the story. First line: The news of Anders Eckman's death came by way of Aerogram, a piece of bright blue airmail paper that served as both the stationery and, when folded over and sealed along the edges, the envelope. Buy, Borrow, or Avoid? : Borrow -- a literary adventure novel that reads fast. Why did I get this book? : I'd never ready any Patchett so far, and everyone seems to love her. I wanted to know why! Review: I was, I'll admit, a bit dubious about this book. From the blurb, it sounded a bit like the Sean Connery film Medicine Man, which I'm fond of but also find a bit embarrassing. (Or, a lot embarrassing.) 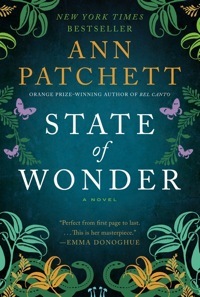 Shockingly, I've somehow managed to become a reading adult and missed out on Patchett, so I was eager to be on the blog tour for the paperback release of State of Wonder. This book has the kind of heroine I love to hate -- but still liked. Marina Singh makes some epically bad life choices -- the kind that made me shake the book in lieu of shaking her -- and yet, I cared for her and I appreciated why she did what she did (mostly). The other characters, secondary and tertiary, felt real as well, fleshed out and thoughtfully articulated in Patchett's clean prose. Dreams and nightmares feature largely in the plot, and normally I loathe long explorations/recounting of dreams, but Patchett kept it together. The dreamy interludes were well-written and moved the plot along and helped me to know the characters better. I really loved this book until the last six pages. The end felt so abrupt and out of step with the thoughtfulness of the previous 340 pages that I was literally jarred out of the story. It changed my love to like -- it was so unsatisfying! Otherwise, I really loved this novel -- the writing was gorgeous and the story unfolded beautifully. Needless to say, I get the wild love for Patchett -- I'm eager to dig into her other books now. I'm thrilled to offer a copy of State of Wonder to one lucky reader! To enter, fill out this brief form. Open to US/CA readers, ends 5/25. Totally agree -- I had pretty much the exact same reaction to the ending. I'm planning to read The Magician's Assistant later this summer! It looks great -- and I loved Patchett's writing style so I suspect I'm going to enjoy her books (unless they all have that whiplash ending style!). I loved this book, but it took awhile for me to really get the ending. When I did, I was blown away, though others disliked it. I am glad to hear that you had a pretty good experience with this one. If you liked this book, you will probably enjoy Bel Canto as well. Very nice and candid review today. I loved it! I suspect I need to reread this one as I want to chew over her writing style and narrative arc -- the ending certainly provoked a strong emotional response in me but I felt betrayed more than anything else. It didn't make sense to me. Others have recommended Bel Canto so that's going on the list, too! I'm so glad this was overall not bad! I love -- LOVE -- Bel Canto (at least partially because it's about opera), and Patchett's essay about Tennessee and her very short book 'What Now? ', so I bought this, but I haven't gotten to it yet. No, in fact, it was really really really good! I'm a super emotional reader so my feelings for a book makes it hard for me to initially step back and be reasonable with my critique -- perhaps the ending will click for me eventually but in my race to finish, it felt abrupt. Others have serious love for this one. I'm dying to start Bel Canto -- because it's about opera, which I love -- and I'm so glad you loved it! I've heard great things about this one, but a lot of readers don't like the ending! I'm really interested to read it myself and see what I think. It's so good -- and I'm grateful it was only the last six pages that went awry. I sort of just keep trying to forget it and move on! I didn't like the ending either. What happened was totally out of character for the rest of the book. I hate being so curmudgeon-y about the end but it really shocked me and not in a good way. It didn't feel right! I'm glad I'm not the only one! I like very much the format of your review. Thanks for sharing your reviews -- I'll take a look! This is the kind of book that I would love to have a reading club for, to help me hash through my thoughts and feelings. I'm sorry the ending didn't work you. You know I adore this book, and I thought the ending was so appropriate, bu t I hate the feeling of an ending diminishing a book's overall enjoyment for you. I also loved Bel Canto and cannot wait to read the rest of her work this year! Carrie -- I know -- I so wanted to love this one, and I really did...until I didn't. I'm really excited for Bel Canto and The Magician's Assistant still -- the writing in this one was amazing. I just didn't get what she did with the end -- it seemed so pointless! Too bad about the ending, it sounds like such a wonderful book. I have read Bel Canto and loved it. I think I will still give this one a try. Anne -- do still give it a try as it really was such a lovely book...until. And who knows -- you may not mind like I did -- many other readers didn't! I completely agree with your opinion about the ending. I finished it on a river cruise and.was so disappointed about the ending I.left the.hardcover book in the ship's library. Carolyn -- I gave my copy away at work -- I was actually getting steamed as the day went on, I was so frustrated with the end! I agree with you about the Heart of Darkness-y elements to the book, and while I didn't love the ending (I think Patchett chokes on the last 5 pages of some of her books), I did love the book overall. P. S. Look closely and you will see the two snakes on the cover (re: your opinion on the book cover). I have my review for this tomorrow (which I sort of forgot about finishing until I saw this review, lol!) but the ending didn't bother me. Actually, I feel like there are a few parts about the ending worth discussing so I'm not too sure which part you're referring to, but I will say it was all very shocking and crazy. I loved this book though! I did love this one and was really taken by surprise at the end. I've read all of Patchett's books and loved the audio version of this one. I wasn't as bothered by the ending as most people seem to be though. Great cover for this paperback edition, too. The Magician's Assistant is my favorite Patchett novel and, oddly enough, Bel Canto is the one I liked least. You review makes me want to read Sena Jeter Naslund. I missed this book on the list of review books somehow - ugh! I cracked up with your mention of Medicine Man and can relate to your embarassment. I'm so glad to learn the book is much better than that movie! I'm quite curious about the ending now! Love your review and all the additional info! Darn, I'm sorry the ending didn't turn out like you'd expected - it's a bummer when those few pages totally change the way you felt about the book. I had images of Sean Connery's Medicine Man as well (I can do a mean imitation - well I think so at least). I really liked the book (my thoughts:http://manoflabook.com/wp/?p=5355) as well but also thought the ending was rushed.